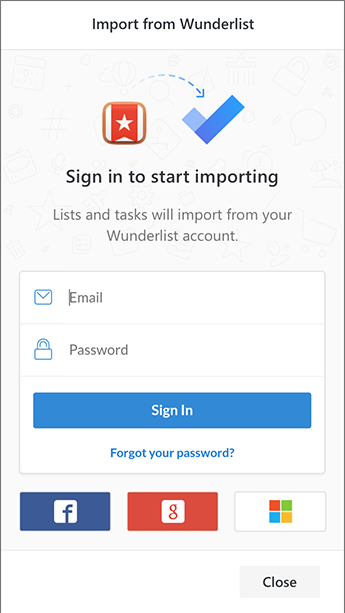 Once you've signed in, we'll show you the number of lists and tasks that will be imported from your Wunderlist account to Microsoft To-Do. Folders, file attachments, assignments and shared lists that you do not own will not be imported. Select Import begin moving your lists and tasks over from Wunderlist to To-Do. When the import is finished, you can view a summary of everything that was imported by selecting View Details when prompted in the app. Alternatively, you can also view the summary at any time by heading to Settings and selecting the option to Show import summary. 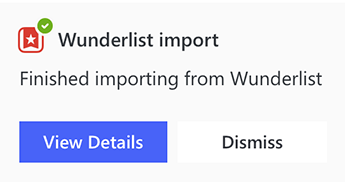 Please note that the import is a one-time action -- your data in Microsoft To-Do will not remain in sync with your Wunderlist account. 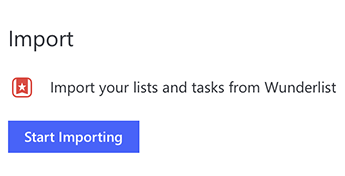 Folders, file attachments, assignments and shared lists that you do not own will not be included in the import.